The ABBA people sort of working out and very much fooling around with their bodyguard Richard Norton during the Australia tour in March 1977. The 1st One: They are doing "MMMMM"
Haha! these are fun to see..
Its said that apparently Benny was the only (lazy) Abba member who rather prefered to be in his room smoking his ciggies while the superfit Bjorn, Frida and Agnetha were always ready to excercise. Yeh...maybe he just decided to show up himself in the garden for a quick Power Ranger impression! LOL! frida's like "oh my god! 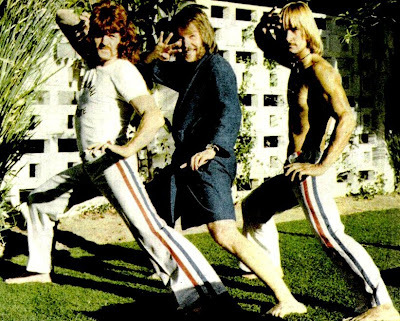 *nervous laugh*"
ABBA in a playful mood in 1974.